In the late 80s and early 90s, rock bands wore make up and had frizzy hair. From the bleak and rainy surroundings of Seattle,Washington, A new genre of music was beginning to flourish, the new sound was alien to the popular rock music of the day. This was a more angst ridden and more raw, just the way rock was meant to be. This genre would be baptized as grunge. Music tends to pull at the heart strings and the souls of its listeners and some of the grunge bands did just this. Nirvana is arguably the most famous among a multitude of grunge bands. Consisting of Kurt Novoselic, Kurt Cobain and their drummer David Grohl, Nirvana rose from Aberdeen Washington and went on to disseminate the hair bands with a single song “Smells like Teen Spirit”. Nirvana enjoyed success across the globe. Then tragedy raised its ugly head, the grim reaper grasped the hands of Kurt Cobain and dragged him away under mysterious and drug laden circumstances. Nirvana as a band ceased to exist after the demise of their beloved frontman. . Cobain came from a broken home but tried to create his own legacy through his own family. Cobain was an ambiguous character who was surrounded by rumours and was tortured and turned to the dizzying worlds of narcotics to counter act the raven of troubled thoughts. Cobain died with a self inflicted shot gun wound to the head and the trigger was pulled by the hands of Heroin. 8th April marks Kurt Cobain’s 16th Death Anniversary. Fans laid wreaths at the Seattle center as the a public vigil was held. He is survived by his wife Courtney Love and his daughter Francis Bean Cobain. 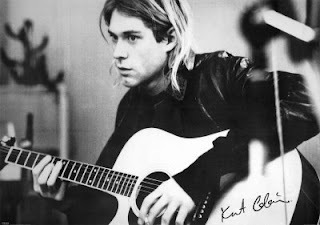 Cobain was a a man who fought his inner demons under the tutelage of heroin and ultimately his master took his soul.